I love pie! I know that I say “I love…” a lot but I do, which is why I started writing this blog. Pies are just a great dessert anytime of year but there is something about summer fruit pies that are extra delicious. Peaches and blueberries are my favorite kinds of pies and when I saw this recipe by my “friend” Ina, the Barefoot Contessa, I knew I had to try it, it has peaches, blueberries and plums. And it’s not really a pie but it’s like a pie; a deconstructed pie. Now I have some pretty strange food issues as some would call it, I do not like fresh blueberries but I love them when they are used in baking. And as for apples, I like to eat apples but do not like them in baked goods, strange I know. But I really like peaches just about any ol’ way! So here is a fabulous recipe for a Summer Fruit Crostata. Thanks again Ina! Roll the pastry into an 11 inch circle on a lightly floured surface. Transfer to parchment paper lined baking sheet. *I did not peel the peaches and they were fine. 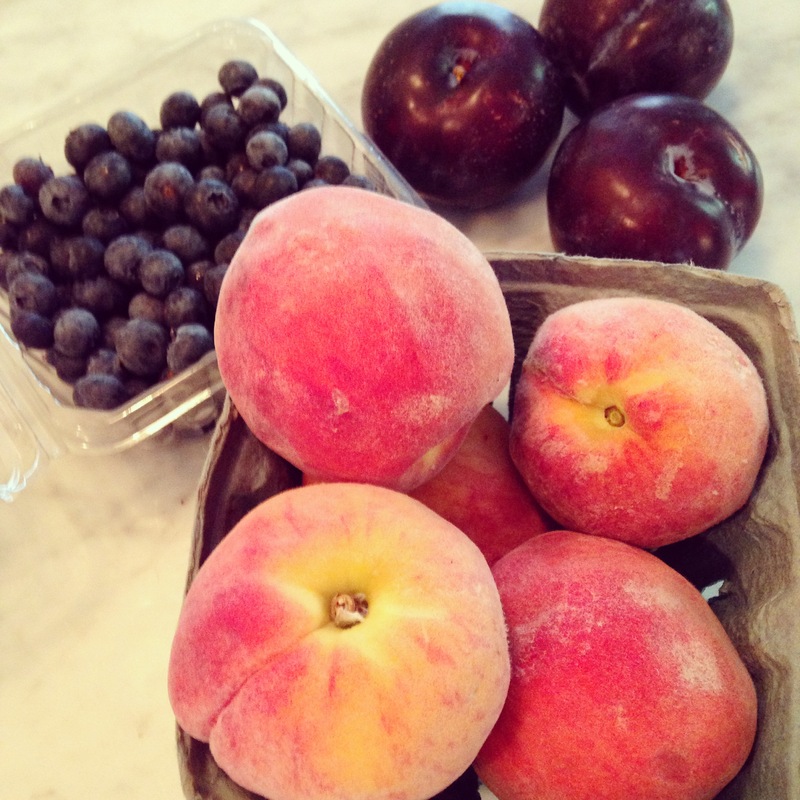 Cut the peaches and plums in wedges and place them in a bowl with the blueberries. Toss them with 1 Tbs flour, 1 Tbs sugar, orange zest and the orange juice. *I only used 1 Tbs of orange juice because when I made it the first time I made with 2 it was too juicy and the crust got soggy and broke up. 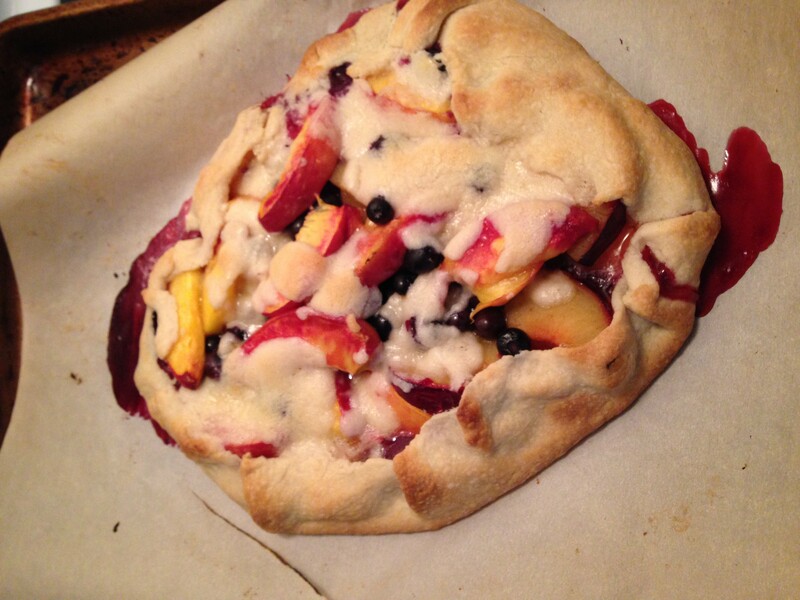 Place the mixed fruit in the middle of the dough circle, leaving a 1 1/2 inch border. Combine the 1/4 cup flour, 1/4 cup sugar and kosher salt in the bowl of the food processor fitted with the steel blade. Add butter and pulse until the mixture is crumbly. Pour into a bowl and mix it with your fingers until it starts to hold together. Sprinkle evenly over fruit. Gently fold the border of the pastry over the fruit, pleating it to make an edge. Bake the crostata for 20 to 25 minutes, until the crust is golden and the fruit is tender. Let the crostata cool for 5 to 10 minutes and then using 2 spatulas transfer to a wire rack and let cool. Serve warm or at room temperature and of course with ice cream!